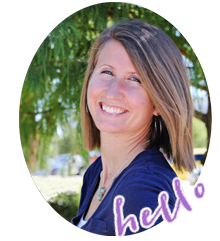 Want to know what the most popular post on this blog is? By a wide margin it is: How to Cook Fresh Green Beans. 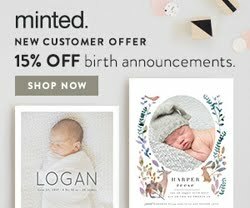 Seriously, this post gets hundreds of hits a day and has tens of thousands over the lifetime of this blog! I have no idea. Apparently there is a shortage of people who know how to properly cook fresh green beans, and if so, I'm happy to help increase public awareness. So this got me thinking about another vegetable that most people probably don't know how to cook properly: brussels sprouts. Stay with me now. After a lifetime of thinking the sprouts were a horrible torture of a vegetable, I actually tried one. Mind explosion. Brussels sprouts are good! I am not joking. Jordan and I keep trying to convince our friends to try them, but no one will listen. 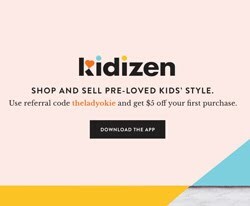 Hopefully this post will inspire you to at least give them a taste and see what you think! Your first mission is to go by the brussels sprouts. At my local grocery store, I find them in the vegetable aisle along the wall where all the fresh veggies get misted every five minutes. For just two people, you will probably want around a pound, maybe a bit more, but of course that's up to you! If you buy them in season, they are around $3/pound. Out of season, I've seen them as high as $7/pound, which is why we only eat sprouts in the fall and winter. They're good, but they're not $7 a pound good. 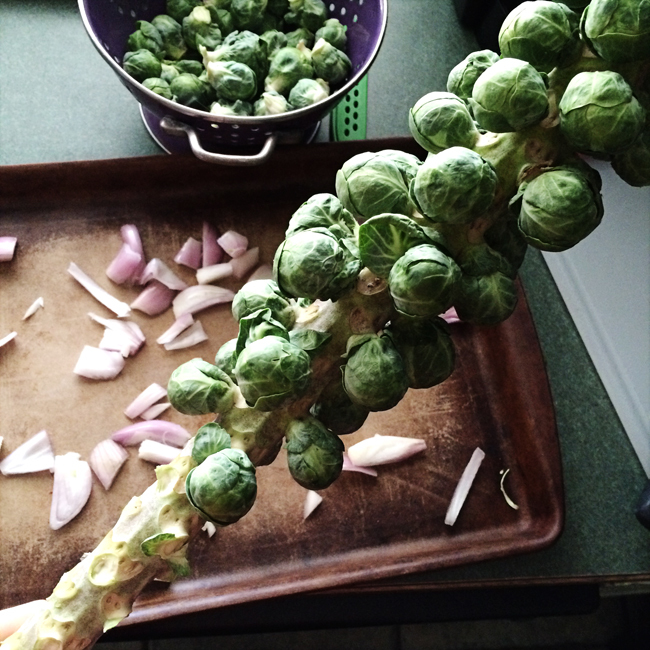 You can also find brussels sprouts on the stalk like in the photo below. If you buy them on the stalk, you simply snap the heads off and you're good to go. Once you have your individual heads, you will get a knife and cut off the bottom end. Then, cut the brussels sprouts in half. This step is essential. We tried them once without cutting them in half just to see what happened, and they are definitely not as good. If it's a particularly large sprout, feel free to cut it in quarters. Once they are all cut up, your pan will look something like this ^^^. At this point, you can add another veggie or chopped potatoes to the pan if you want. Sometimes if I have an onion lying around, I'll chop up an onion and mix it in with the brussels sprouts. Other times I will chop up some baking potatoes into chunks and mix them in. The world is your oyster! Or, sprout, as you will. ^^^ Here is what your pan might look like after you added in chopped potato and a chopped onion. Once your baking pan is assembled, drizzle olive oil over everything and generously sprinkle kosher salt and freshly ground black pepper to taste. Mix it all around with a spoon. Feel free to add your seasoning of choice if you like rosemary, garlic, etc. There is no exact science to this! But the olive oil and kosher salt are a must, in my opinion. Place your pan in the oven (uncovered) at 375 degrees on the middle rack and set the timer for 15 minutes. After fifteen minutes, your sprouts will probably look bright green. They are not ready to eat. Give everything a good stir and put the pan back in the oven for another 10-15 minutes. After the timer goes off again, check and see if the sprouts are done. 1. If you stick a fork in them, they are soft. Hard sprouts are gross and terrible. 2. The brussels sprouts are no longer bright green but are turning black on the edges and look frizzled (like they are shrinking in size). If they aren't ready yet, try turning the oven up to 400 and putting them back in for another 5 minutes or so. Better overcooked than undercooked. Trust me. When they are soft and turning black, they are ready to eat! Feel free to taste and add a bit more salt if you would like. There are obviously other ways to cook brussels sprouts, but this is the best way that Jordan and I have found. They turn out delicious every single time! We have also had success sprinkling some balsamic vinegar over the top once they're done. If you give these a try, please let me know what you think. 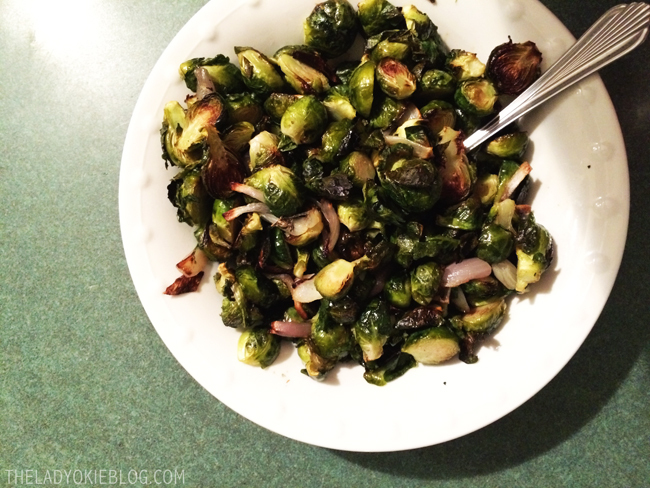 I'd love to know if this recipe converts any brussels sprout haters out there. 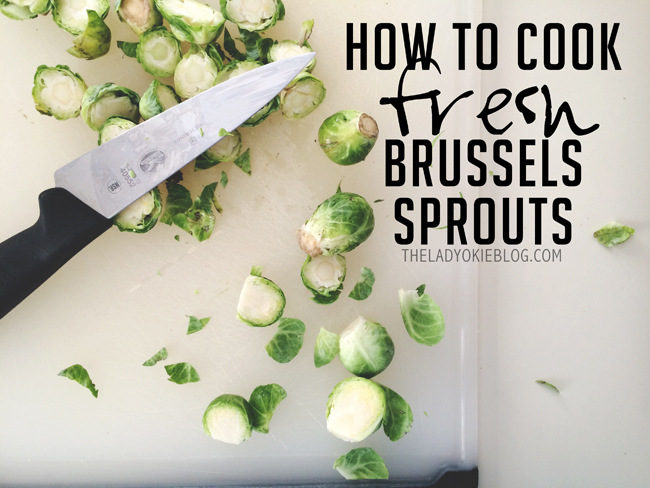 Also, if you have successfully made brussels sprouts using a different method, do share! Good luck! 2. 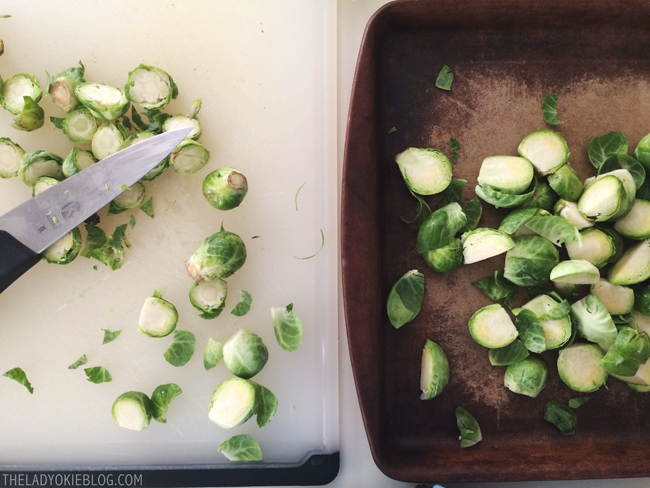 Chop ends off the brussels sprouts and cut each sprout in half. 4. Roast on the middle rack for 15 minutes. 5. Give everything a good stir. 6. Roast for another 15 minutes or until brussels sprouts are fork tender and starting to blacken on the edges. I guess I better go check out your green bean post ;) I have never made brussels sprouts myself, but when my SIL makes them they are DELISH! I will have to try this recipe since I don't have hers! I hated Brussels sprouts until I tried this roasted Brussels sprouts and bacon salad with a beer vinaigrette. Changed my whole world. I've been wanting to make them but I've been a littler nervous. So thank you. I needed this. Once I had Brussels sprouts with potatoes there was no turning back. YUM! YES. MA'AM. 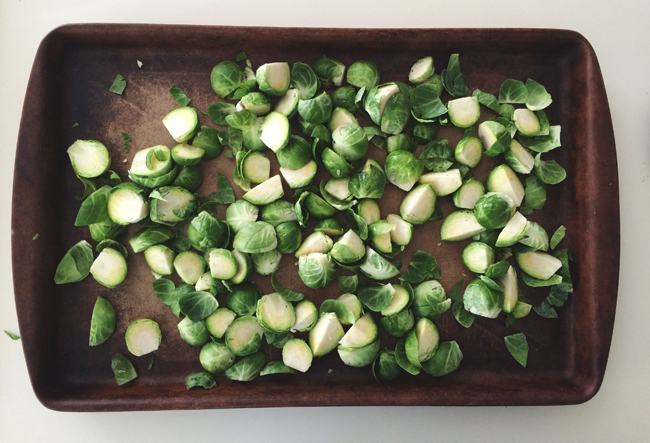 Brussels sprouts are one of the least appreciated of the veggies. Pro tip from my mom: any time I roast veggies like this, I put all the chopped veggies in a ziplock with olive oil before roasting. Shake it around to get them good and covered. Then I dump them on the pan and add the salt/pepper/all the yummy seasonings and continue per recipe. Just helps the veggies be more evenly coated than drizzling oil. I'm one of those people who hates brussels sprouts but I am going to give this a try! I am aways looking for new veggies and healthy recipes. I will report back! not gonna lie, i've never even tried one. we have some frozen ones in our freezer though... how do i prepare those? also, off to check out the green beans because basically i know nothing about cooking. I love Brussels sprouts! I like to add balsamic vinegar to kick them up a notch. We just started eating them in the past year or so. Who knew they were so great? I totally have to try this! One time I had some at a friends house and I thought they were pretty good. Then I tried to make them and they were nasty. I don't know why I never thought to cut them in half. Duh. I'll let you know when I try your method out! I love putting balsamic vinegar and dried cranberries on roasted brussels sprouts. I even took them to a potluck once and had people raving about them that way! I love brussels sprouts, too! I had never had them up until a couple years ago. I usually get them frozen, though and just steam them on the microwave. However, I really like the look of your fresh ones. I've done them once fresh but on the stove top in a pan with some olive oil and salt. So, I'll definitely have to try this! Mmm, I love Brussels sprouts. We eat them very regularly and roasting is definitely the go-to prep method. When I was a kid, I HATED Brussels sprouts. I wondered why Mom wanted to punish us by making us eat them. (And kale--way before anyone else was eating it--she cooked it until it was gray). Anyway, now BS are my favorite vegetable. Given the choice, I would opt for them over dessert. And if you knew me, that is saying a lot. Thanks for sharing this delicious method--I had never thought of pairing them with taters. 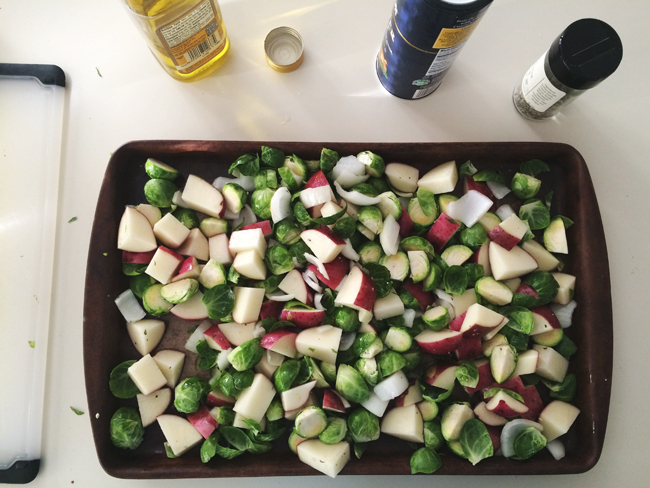 This is my absolute favorite way to cook the sprouts, and we eat them at least once a week because they are so good. I never would have thought about putting the potatoes on the pan with them, though! I usually do them separately. If you want to go wild and decadent, add some bacon (though I don't recommend doing it too often). 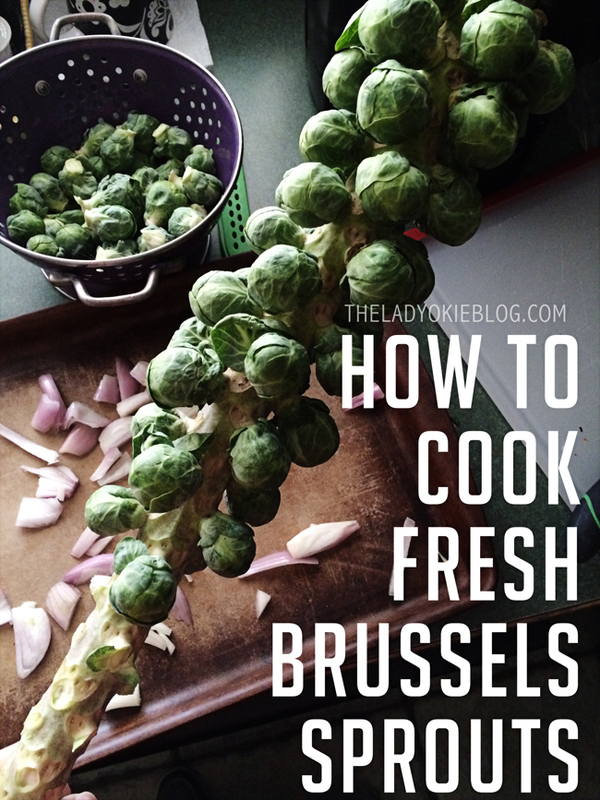 Oh my goodness, I LOVE brussels sprouts SO much and this way of cooking them sounds fabulous! I never knew brussels sprouts grew on stalks like that. Also why in the heck is it 'brussels' with an s? I always said 'brussel' but then a red line came up saying I didn't spell it correctly. YUM!!! This looks like a great way to cook them...The whole oven roasting anything other than meat and potatoes is new to me, but I'm slowly trying different things. roasting 4eva. ALTHOUGH a few weeks when we had a big dinner party there wasn't room in the oven for the BS so I blanched them in boiling water and then cut them in half and then sauteed them in a cast iron pan and it was almost as good?